With the MOT coming up shortly, time to get everything in order. My GT would have come with two Lucas rear fog lights originally, but at some point it looks like one was replaced with a wider Raydyot one - presumably due to damage. It's this replacement which has rusted through inside and needs to be replaced itself. I don’t like replacing stuff on the car unless I need to, but finding a new internal fixing to fit this light would be tough, plus I know it wasn't original anyway. You can see from the photos the difference in size between the Lucas original and the Raydyot. 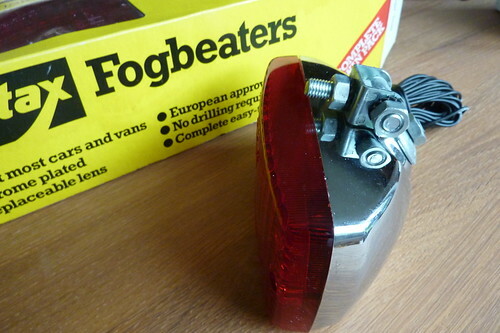 A trip around ebay turned up what I was looking for - a set of period accurate, albeit not Lucas, Britax fogs. I could've kept looking for a matching Lucas light, but these Britax chrome-backed ones were in mint condition, still in their box with all the brackets, wiring, connectors and even bulbs still inside - they were even endorsed by Jackie Stewart, 'nuff said! Getting the old fog off wasn't easy - the bolt had completely rusted and the plastic case meant getting purchase on the bolt-head was impossible. After a lot of mucking about I'd had enough and out came the hacksaw. With the bolt now accessible, a couple of turns and - it sheared in two, entirely rusted! Luckily the bracket was still solid, so I could reuse that rather than installing the new ones. A quick blast with the drill widened the hole in the bracket enough for the larger bolt for the new light and we were almost there. The Raydyot wiring was different to the Lucas and Britax in that both earth and live went into the casing. The two latter lights’ earth connection sits outside the casing on the bolt, so I had to swap the spade connector for a ring terminal to sit over the bolt - you can see the earth in Fig 6. With two working fogs, my debate now is whether to fit the other chrome Britax in place of the Lucas so the car finally has a matching set again! Wiring diagram on the box - all connectors were included.